Are you worried about the financial and productivity consequences of downtime and data loss? Do you feel that your IT environment is at risk of a security breach? Are you looking for 24/7 proactive IT support, as well as recommendations for upgrading your aging systems? Do you require IT compliance with regulatory standards like HIPAA, SOX, PCI, and GLBA? Are you frustrated with your current IT service provider who just can’t get it right – no matter how many times they work on your IT problems? If your answer is “yes” to any of these questions, it’s time to rethink your IT service and support and consider USWired. Peace of mind is often touted but rarely delivered. Not so with USWired. That's because uncompromising, best-of-breed customer service is ingrained in our culture. It's why we've been trusted to build, maintain, and support so many critical IT infrastructures for the last two decades throughout the greater San Francisco Bay Area. 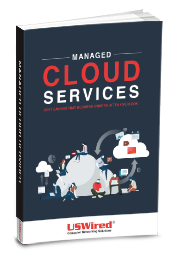 It's also testament to what we consistently deliver - 24/7 managed IT support services; a stable and secure network; scalable and cost-effective IT solutions that maximize productivity; and always-on, secure cloud services, under any and all conditions. Our mission is to give you and your business the cover you want, the assurance you need, and the peace of mind you deserve. Now that's doing IT right. Save yourself stress by outsourcing your IT support. Hundreds of businesses, from small to large enterprises, have chosen USWired to shoulder their IT burdens, giving them more time to dedicate to their customers. Never worry again about upgrades, losing data or not being able to access your work. The cloud allows perfect collaboration while streamlining your office work processes and saving you money. Let USWired help you make the move. Got a big IT project on, or have plans to expand and grow? Whatever your needs, USWired's team can create tailored IT infrastructure solutions that are reliable, scalable, and secure. I've always been very satisfied with the standard of integrity, commitment, and customer service provided by USWired, as well as their extensive knowledge of a wide range of computer networking technology. They know what they’re doing, and it shows.